It’s been hell on wheels this week at work – and while I’ve resolved myself to leave the shop talk out of my blog, I’ll just say it ain’t over yet. Today was a work day (yes, its Saturday), and next week will be nearly utter insanity, with our biggest fundraiser of the year. But… if I get through this week, it’s a downhill slide into the holidays (thank goddess). Among the madness that was this week, I managed somehow to make us a really nice dinner one evening, which included homemade tortillas. This is a really simple, easy recipe for fish tacos, but it does require some specific ingredients which are hard to substitute. First, a word on achiote. 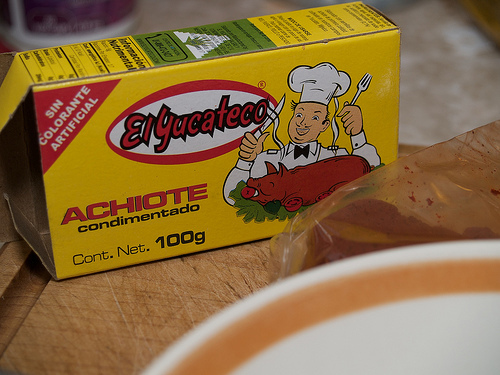 This paste, a Yucatan staple, is a flavour like nothing I’ve ever tasted before. It’s used to make cochinita pibil (slow roasted pork, usually wrapped in banana leaves and roasted in a pit, but you can also make it in your slow cooker at home) and all sorts of amazing marinades for meats. The base spice is called annatto, which is a kind of seed that grows on trees and its what gives it that amazing colour of red. They use this seed in many products as a natural colouring. But in Mexico they blend his rock-hard seed with a mixture of garlic, salt and spices, and grind it all up to make this incredible paste, which, when mixed with fresh lime juice, makes for a fiesta in your mouth! I usually buy it at Perola’s, a Latin supermarket in Kensington Market in Toronto. It usually retails for about $2.70 and for making fish tacos you need only about a 1/4 of the package. You would usually use a full package if you were making cochinita pibil. I should add here that achiote space does not contain any hot chilies, so even though its red in colour, its not spicey at all. Next come the tortillas. Mmmmm. Warm, fresh tortillas are incredibly heartwarming and satisfying, and once you have the right tools and ingredients, they’re not hard at all. You can get away without a tortilla press but to be honest, why bother? I found mine in Chinatown at Tap Phong Trading for about $15 (who knows why a Chinese hardware store is carrying Mexican cooking tools). You can use a rolling pin but the press gives you the most consistently thick and round tortilla. Note, you also need two pieces of plastic, about the size of the press (more on this later). Next you need a corn masa flour. The one I have found most readily available in Toronto is Maseca, and I’ve seen it not only at Perola’s and the other Latin groceries in Kensington but even at my local Fortinos, and other larger groceries with a well-stocked ethnic food section. Note that you want corn masa, not the tamales mix. Finally, also not required but useful to have, is a tortilla warmer. This is not essential at all and you can just wrap them with paper towels and a tea towel and them keep them in a low temperature oven until ready to eat. But a tortilla warmer is handy. Mine is a silicone one designed by Rick Bayless that I ordered from Golda’s Kitchen, but they don’t seem to sell it anymore (they do however carry lots of the traditional ones). Heat a dry skillet to a high heat. 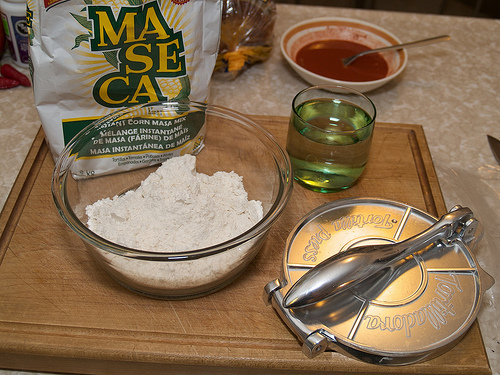 In a medium sized bowl, blend the corn masa with the water and mix using your hands to fully blend into a dough that holds together and is not sticky. Divide the dough into 8 evenly sized balls, about 1 1/2 inches in diameter. If you’re not working super quickly, cover the bowl with the dough balls with a dampened tea towel to keep them from drying out. This is especially useful if you’re making a large batch (this recipe can be doubled or tripled if you’re feeding a crowd). Using a tortilla press, place one piece of plastic on the bottom and then place your dough ball in the centre. Lay over it the other sheet of plastic and then press your tortilla. It will be about 2 to 3 mm thick. Remove the plastic/tortilla pancake and laying it flat on the palm of your hand, gently peel away one side of the plastic. Flip it to the palm of your other hand and peel off the back layer. Using your hand like a spatula, gently “throw” down the tortilla onto the hot skillet so that it goes down nice and flat and evenly. Cook for about 30 to 45 seconds per side. Use a spatula to flip it over. You’ll notice if you’re dough is the right consistency that the tortilla will puff up in spots. It doesn’t have to be browned to be done, as they need little cooking. 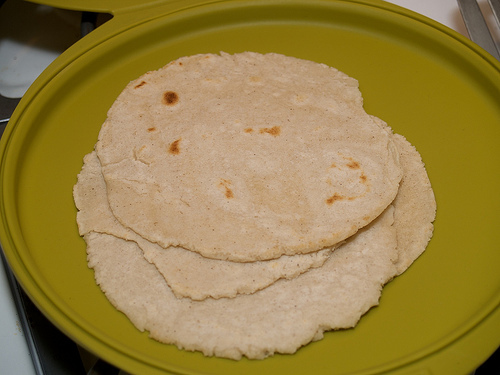 Place cooked tortillas onto some paper towel or in a tortilla warmer and keep them covered to prevent drying out. Repeat this process with each pressed tortilla until finished. Keep the tortillas warm in a low-temperature oven, wrapped up, until ready to eat. 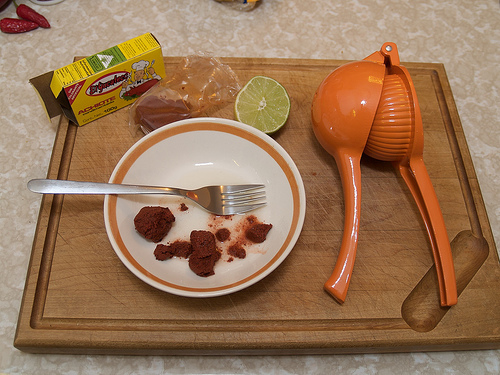 In a small bowl, combine the achiote paste with the lime juice (using a fork to break up the paste; sometimes microwaving for 10 seconds or so softens up the paste). Place fish in a rimmed baking dish and cover with the marinade, ensuring bottoms of fillets are coated. Cover with foil and bake in a 350 degree F oven for about 10 to 15 minutes, depending on the size of the fillets. The fillets are cooked when the flesh is opaque and flakes easily. Break into pieces and serve in soft corn tortillas. Note that you can also cook the fish on the stovetop, with the marinade in a skillet with a bit of oil, if you prefer, but I like the flavour of the fish baked with the achiote. 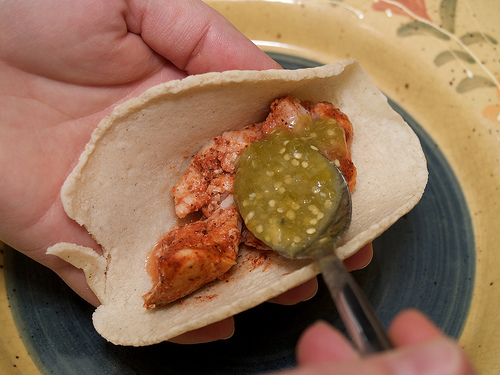 Serve your tacos with some kind of salsa or hot sauce (salsa verde, or tomatillo salsa tastes great with the fish).